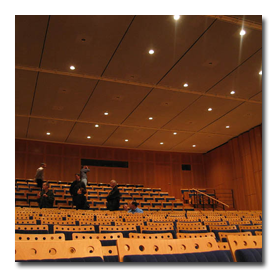 For a long time the auditorium of the Folkwang-Museum in Essen suffered from poor acoustics. 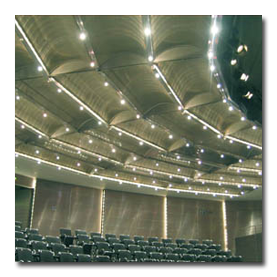 During a major renovation of the hall a Haver & Boecker wire cloth ceiling without further absorption materials has been installed to improve the room acoustics. To follow the design of the hall, the wire cloth elements, which are made from galvanized high tensile wires, were coated in a white colour. During the renovation of the "Stadttheater" in Bielefeld, the architect paid much attention to the interior design. 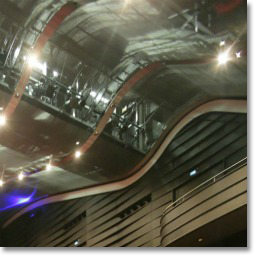 Above the red-covered-seats waves a sinuous ceiling made from MULTI-BARRETTE 8123. The wide arcs of the mesh conceal floodlight bridges and acoustical sails. The stability of the wire cloth allows for this interesting ceiling design. Elements made from DOKAWELL-MONO 3001 were installed in the designated position and remain in this shape due to the stability of the wires. Illumination from below the elements create interesting light reflexions. 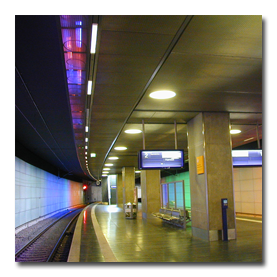 There were various challenges at this project, including covering extensive areas of ceiling without visible sagging; easy to remove panels in all areas of the subway station and consideration of the polygonal shape of the building. Siggrou Avenue is a 3km long, straight and high speed road in Athens. For the safety of the pedestrians underground crossings were built along the street. 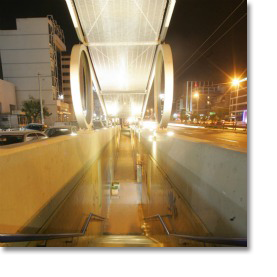 The architectural idea projects the motion of vehicles onto this construction.